To strangers they met in the park. And spin as I wrote in the dark. Believing I’m hitting the mark. A clangorous image quite stark. Poets, it seems, can see in the dark. And clearly the absence of light. I believe that coherency and a genuine effort to exchange are essential elements in a respectful and successful adult conversation, whether it be face to face or in writing. I worry that this, while genuine, is perhaps too opaque. I see the post itself as your own muse, a piece of artistic wonderment. I see the comment section differently. It doesn't matter if the post is "opaque", as you have described it. That is all well and good, and if I ask you to explain it, as if you hadn't succeeded in my view of being understandable, I do not think that you would have any obligation to respond. If on the other hand you saw fit to land anywhere you please, as often as it occurs to you to do so, littering the post writer's area for others to correspond, with random comments full of invective and slurs I would see you as essentially an unacceptable addition and distraction, not worthy of defense. Imagine for a moment that you have just segued into a well thought out portion of a medley. You're playing on the house piano in a jazz bistro where the occasional tinkling of the bartender stirring the ice in a drink is expected. The dishwasher drops a stack of plates. The room startles but you keep tempo. A smile accompanies your playing and attention returns to your efforts and the room is back enjoying it. The dishwasher drops another stack of plates, this one louder. He can be heard complaining loudly. Nobody hears your passing chords taking us to another piece. Your face changes. It's no longer in concert with the medley and the mood intended. The dishwasher sticks his head out the kitchen and hollers at you to quit playing so loudly because his plate smashing is what is most important. You finish the evening eventually, gather your coat and hat to head home, uncertain if you will return to play this room again. The dishwasher sticks his head out the kitchen door one last time and tells you goodnight, wishing you sweet dreams and smiles, expecting one in return. For my taste and from my perspective AJ's comments would be palatable if he stayed focused and on message. However, when he comes to my blog with a bone to pick, or some fat to chew, that bears absolutely no relationship whatsoever to what I've painstakingly written, I take it as a disrespectful affront to me and my effort to communicate in clear, concise, comprehensible prose. As an educator who has spent a career and a lifetime evaluating and guiding the communicative capacities of others, I find it irksome and annoying to constantly remind folks here to remain civil, and at least broadly responsive. AJ's penchant for corresponding with others on unrelated matters in comment streams is disruptive, distracting, and disrespectful. All too often an AJ comment is a taxing conundrum and a unresponsive drag on the leisurely ebb and flow, or the fast paced staccato rhythms, or measured intellectual/academic exchanges in the discourse generated by a post and it's comment stream. In this regard, I'm in ful and complete agreement with aka. Not a problem if he had something of meaning, value, or substance to say. I can only imagine what it looks like to a,casual net surfer, or an internet research specialist. I have a different issue, in addition to his propensity to function as seaweed, wrapping around every keel, propellor, oar, paddle, and swimmer's arm, and making it impossible to get from A to B easily. Some others share my issue but I'm afraid it's more mine than anyone's. He writes about me constantly, and everywhere. I'm not only referenced by (misspelled, and it's deliberate because I've corrected it) name, I'm referenced as Snoopy, plus I think occasionally as Jewish Blogger. (Not as Rabbi, that's Jon.) This is especially weird because I don't delete most of his comments. And the constant references aren't exactly complimentary. They include made up stories plus a series of - veiled in somewhat opaque language perhaps for deniability - accusations. And of course insults. Not to mention quite a bit of condescension. My point in my case is that he is absolutely not benign. Nor is he to AKA, nor Moki, nor ABG. I don't like deleting in general but the truth is it makes no sense not to. Unlike others here I'm not terribly worried about retaliation. What's he going to do, talk about me more? I have to say Enough. I don't like how personal it gets and I don't like his crazy sense of entitlement. The First Amendment doesn't give you the right to piss on everyone's lawns, nor does it give you the right to have your every letter to the editor and editorial published. We are the editors of our blogs. I don't like piling on, but he's been piling on me for years. Enough. By the way, Rodney, I like the post. 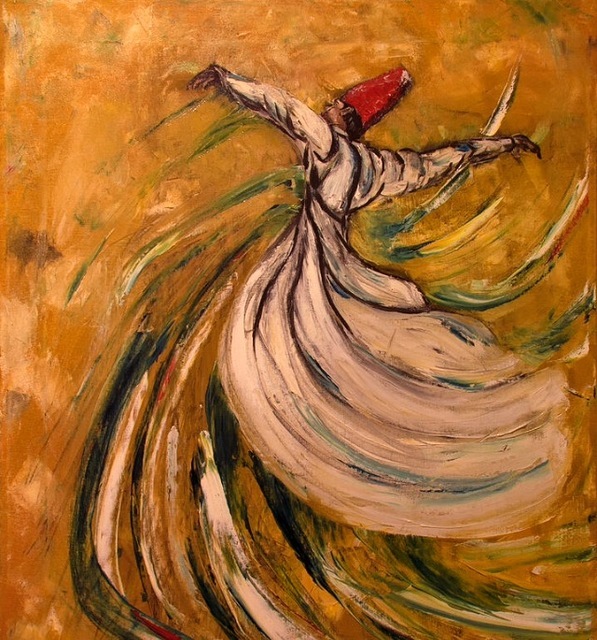 I like this poem, Rodney, although any concerns about being opaque are rather unwarranted, imho.... nice image of whirling Sufi Dervish, too. If this was a street corner with all of us in 3D, would you all be pointing out Arthur or another alternatively-oriented soul to everyone else who passes by and let them know this one doesn't belong, he's not behaving the way you wish he would? @AH; ." My two cents...."
"Who would stand there and engage the guy with, "Why aren't you behaving correctly?" I would...And ask "Is there anything I can help you with? "